There was a bit of a buzz about six months ago around Russell Brand and his political views. A lot of the attention centred around his interview with Jeremy Paxman on Newsnight, although a clearer statement of his ideas was to be found in his article for the New Statesman. At the time, I found the rants well-written, well-expressed, interesting and entertaining. I was glad that someone was making these arguments in mainstream media: there is such an ideological vacuum in current politics that having a genuinely passionate, radical speaker, in a primetime slot, was quite refreshing, even if it was Russell Brand. The following letter appeared in The Times on Saturday. “Sir, I am saddened to hear a leading educationalist encourage computer games as a form of learning (“Angry Birds teaches pupils life skills, says schools chief”, May 6). 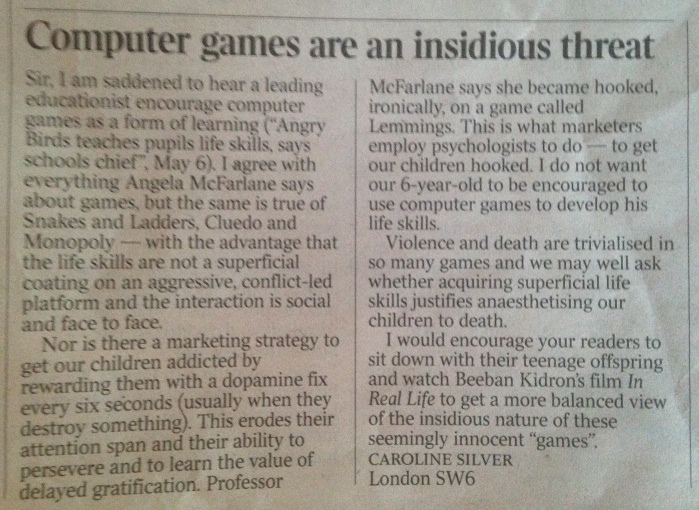 I agree with everything Angela McFarlane says about games, but the same is true of Snakes and Ladders, Cluedo and Monopoly – with the advantage that the life skills are not a superficial coating on an aggressive, conflict-led platform and the interaction is social and face to face. “Nor is there a marketing strategy to get our children addicted by rewarding them with a dopamine fix every six seconds (usually when they destroy something). This erodes their attention span and their ability to persevere and to learn the value of delayed gratification. Professor McFarlane says she became hooked, ironically, on a game called Lemmings. This is what marketers employ psychologists to do – to get our children hooked. I do not want our 6-year-old to be encouraged to use computer games to develop his life skills. “Violence and death are trivialised in so many games and we may well ask whether acquiring superficial life skills justifies anaesthetising our children to death. “I would encourage your readers to sit down with their teenage offspring and watch Beeban Kidron’s film In Real Life to get a more balanced view of the insidious nature of these seemingly innocent “games”. While I don’t necessarily disagree with Caroline Silver’s cynicism about the addictive design mechanisms of computer games, and her scepticism about their educational value, and I enthusiastically second her championing of board games as an alternative, I do find it surprising that she chose to recommend Snakes and Ladders, Cluedo and Monopoly as her examples. As a self-admitted board game nerd, this suggests to me that Ms Silver doesn’t know much about board games.